Now, to the calendar: the calendar was truly behind the number system and vice versa. 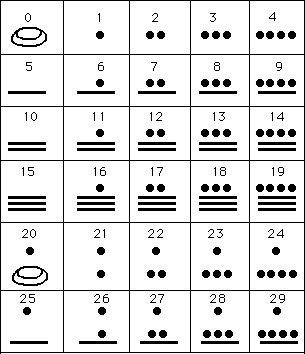 They had two calendars: Tzolkin with 260 days, with 13 months of 20 days each, and the Haab with 365 days, with 18 months of 20 days each and a shorter month of 5 days (called Wayeb). The Tzolkin was a ritual calendar, while the Haab was a civil one and the Wayeb was considered “unlucky”. With these two calendars, it is possible to see when they would return to the same cycle: the least common multiple of 260 and 365 is 18980 days; equivalent to 52 civil years or 73 ritual years. Astronomy also played an important role for instance, Mayan astronomers calculated Venus‘ synodic period (after which it has returned to the same position) to be 584 days. In two 52 year cycles, Venus would have made 65 revolutions and be back to the same position. On December 21, 2012, the 14th Baktun starts with the representation [13.0.0.0.0] and of course the 13th Baktun finishes… but certainly not the world!